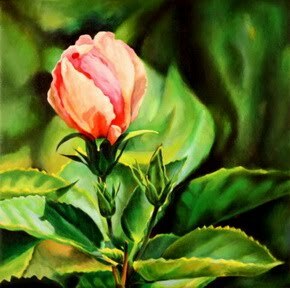 “Just Peachy”, acrylics on canvas, 24″x30″, © Donna Grandin 2010. Donna has 5 paintings available at the AGH fall art sale, Style & Space. For more information on the exhibition, visit Art Gallery of Hamilton Fall Art Sale. Also, Donna’s magnolia painting “Change is in the air”, acrylics on canvas, 13″x16″ is featured in this video clip promoting the event on CH Morning Live. Donna attended the preview on Wed night and was proud to have been chosen as part of the group of 65 area artists, because it was a very strong show with quality work in a variety of media, styles & subjects. The show closes Sun evening. Detail of The Lullaby, 36″x24″, acrylic painting by Donna Grandin, featured on the cover of 34th Parallel magazine, issue 12. Oct 2010. Donna is proud to announce that her art was chosen for the cover of Issue 12 of the quarterly literary magazine, 34th Parallel, which came out today. 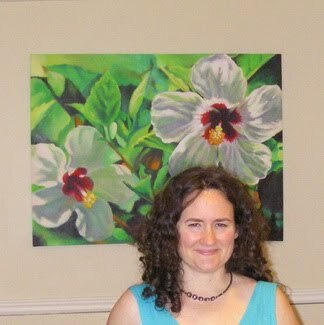 A few more of her hibiscus paintings are also featured in the article Create or Die, which is based on Donna’s blog interview by fellow St. Lucian, writer Natalie D’Auvergne, in July. Special thanks to Natalie D’Auvergne, and magazine editors Martin Chipperfield and Trace Sheridan Swan. Juried in to Art Gallery of Hamilton Fall Art Sale! “A fresh start”, acrylics on canvas, 24×24″, 2010, Donna Grandin. Sold. Art Gallery of Hamilton Fall Art Sale, Nov 4-7, 2010. Donna was pleased to be included in this group exhibition, there is always such a beautiful selection of work. The painting above was apparently purchased by a local couple. The Square Foot Show at the AWOL Gallery in Toronto, Aug 21-Sept 5, is now over, but it is an annual group show, so if you did not get a chance to see it this year, look out for it next year. Natalie D’Auvergne is a St. Lucian writer living in L.A. She featured Donna recently on AphroditeAres’ Blog, “The Creative Process as a Path to Self-Discovery: An Interview with Donna Grandin”. Later, the interview was edited for inclusion in the online literary magazine, 34th Parallel, along with some photos of my paintings. 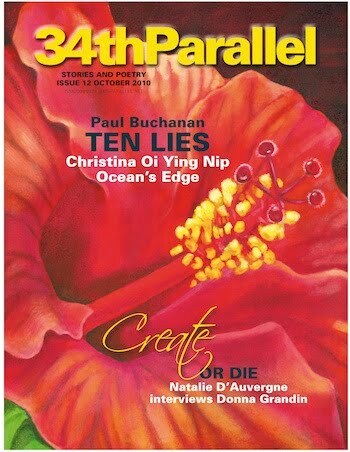 A detail of Lullaby (red hibiscus) was used for the cover of the magazine, along with the title the editor came up with “Create or Die”. Not the words I would have chosen … but then headlines are often all hyperbole! Donna Grandin in front of “The would-be twins” 48″x36″. 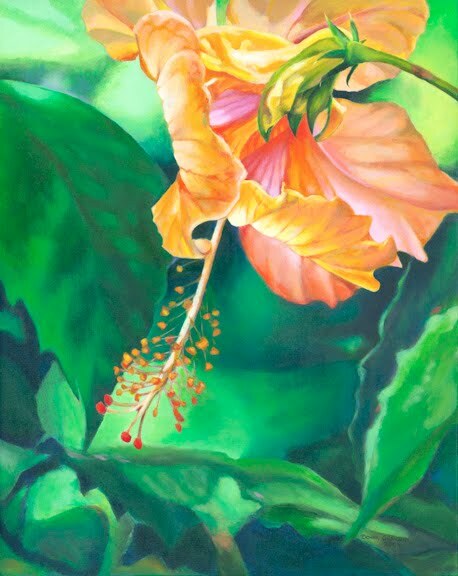 The new series of acrylic paintings by Donna Grandin, “Hibiscus ‘n Bananas” was introduced at Blue Roots Art Studio, Donna’s home studio, on Wednesday, 16th June. The Opening was from 6-9pm on Wed, but the exhibition stays up till June 23rd. 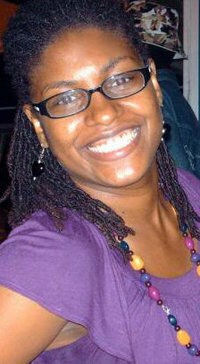 It was also the official launch of her website, www.bluerootsartstudio.com. On Thurs, there was an unveiling ceremony at 400 McCowan, for the mural Donna was commissioned to paint by the City of Toronto. The rope was pulled by Councillor Glenn De Baeremaeker and some of the tenants. The community had held a contest, and the winning images were incorporated into the mural, so that it would portray the spirit of the community. This painting was created in my studio, on 4 panels, 4″x8″ each. It was my first mural, and my first “commercial” painting job, usually when I do paintings they are for individuals who enjoy my work but have something specific in mind they’d like me to paint for them. So, I pretty much painted exactly what was on the digital file they e-mailed me, but in retrospect – and especially if I was involved from the beginning, instead of being asked to step in and help complete the project – I should have taken more artistic license with the image. And by that I mean, the hard edged clouds on the left are just not “me”, whereas the soft colourful clouds on the bottom right are much more so. Still, this project was a great experience in many ways! 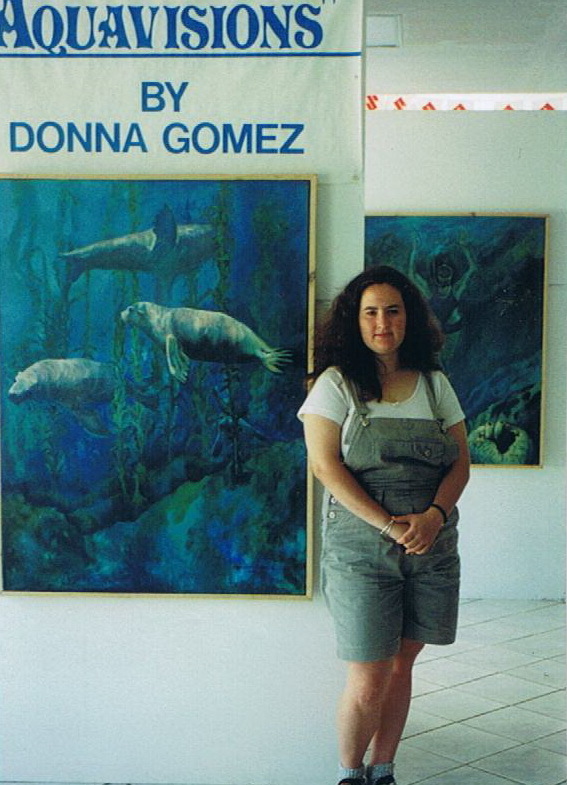 Donna in St. Lucia at her first solo exhibition, in summer 1996. Some time in 2009, Donna started using her married name, Donna Grandin, on her paintings. Art created previous to this would have been signed with her maiden name, Donna Gomez. This exhibition was a milestone in my life, I received so much support from family, friends, the press, and the general public who came to see the art. It was held in the showroom of my uncle’s Suzuki car dealership at the time, Sunset Motors Ltd. The artwork was mostly from my third year of study as an art student at McMaster University, and the theme was water … the sea & its inhabitants, real or imagined. Some of the people who became my collectors in that first show are still my most avid fans, and I’ll always be grateful for their love and support.